As with other cities in Arizona, such as Phoenix, accommodation in the city of Tucson varies greatly in price throughout the year, with lodging rates noticeably peaking during the winter and spring periods. Hotels around central Tucson tend to be amongst the most expensive that the city has to offer, due to their convenient central location and proximity to the plentiful restaurants within the Downtown Arts District. 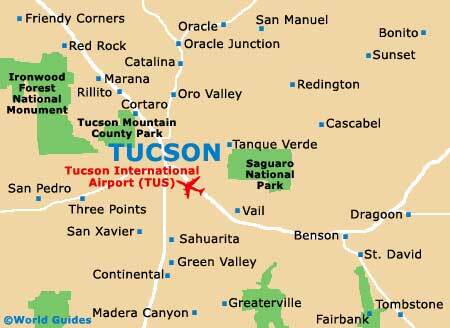 There are also some hotels close to the Tucson International Airport (TUS), which is to be found approximately 10 miles / 16 km to the south and near to Emery Park. Notable neighboring airport accommodation comes in the form of the adjacent Best Western Las Brisas Hotel on the South Tucson Boulevard, which is just minutes from the Main Terminal. Close by, further airport hotels lining this boulevard include chains such as Clarion, Comfort Suites, Country Inn, Courtyard, Hampton Inn, Holiday Inn, Hyatt Place, La Quinta, Radisson and Residence Inn. Budget travelers will find a number of cheap lodging options to choose between. Particularly notable is the favorable accommodation available at the Roadrunner Hostel on East 12th Street, which is surprisingly central and close to both the Military Plaza Park and the Tucson Children's Museum. Also of note and a little more expensive is the highly recommended Days Inn and Suites Hotel on South Craycroft Road, offering one-star lodging near to the Country Fair Shopping Center. Similarly priced is the Travelodge on West Ina Road, which has received mixed reviews and is located some 7 miles / 11 km from downtown Tucson. For a little-more money you can soon move into the three-star category of accommodation, with the Ramada Inn Suites Foothills on East Tanque Verde Road being a reliable bet, close to the Gaslight Square Shopping Center, the Tanque Verde Shopping Center and the Morris K. Udall Regional Park. 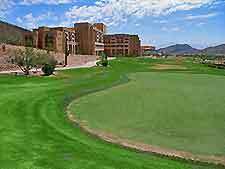 Keen golfers may like to consider staying at the Golf Villas at Oro Valley on the North La Canada Drive (on the far northerly outskirts of Tucson), where condo-style villas come with breathtaking mountain views and a close proximity to an array of acclaimed golf courses. A little more pricey and rather more central is the three-star Residence Inn Tucson Williams Center Hotel on East Williams Circle, which is to be found near to the Park Place Mall. 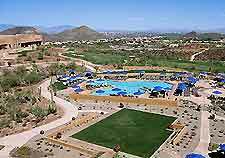 For something a little different to mainstream chain hotels, consider staying at the northwesterly all-inclusive White Stallion Ranch on West Twin Peaks Road, which is nestled at the base of the Tucson Mountains and next to the Saguaro National Park. This working cattle ranch offers the atmosphere of the Old West and allows you to experience horseback riding like a true city slicker cowboy. Boasting five-star accommodation, the family owned Arizona Inn on East Elm Street, next to the University of Arizona campus, comes with spacious landscaped gardens and makes for a good base for Tucson sightseers. 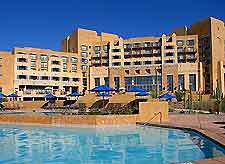 If money is no object, then the Canyon Ranch Health Hotel Resort on East Rockcliff Road is for you, where a host of indoor and outdoor activities are available, together with extensive spa facilities in a purpose-built complex and superb views of the Sonoran Desert mountains.